I love zucchini in the Summertime! It is always a great value at our local farmer's market and I try to work it in to our meal plan each week. 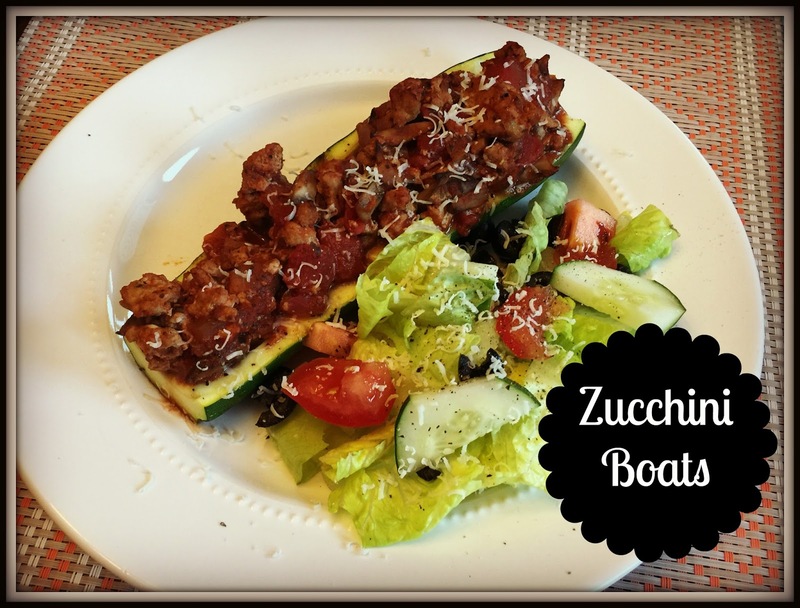 These zucchini boats are a favorite for sure and come together pretty quick. You can make them a few days ahead of time and just bake them when you are ready. Add a salad and dinner is done! Heat a large pan with 2 TBSP of EVOO and add the onion. Saute over medium heat for 3-5 minutes. Add the turkey and heat until browned. While the turkey is browning, clean the zucchini and split in half lengthwise. Scoop out the inside, leaving about 1/2" to the skin. I use a melon baller to scoop it out. Sprinkle with salt & pepper. Once the turkey is browned, add the Italian seasoning and the crushed tomatoes. Mixing until combined. Season with salt & pepper if desired. Scoop spoon fulls of the turkey mixture into the zucchini boats. Place in a foil lined baking pan and bake at 375 for 20 minutes. Take them out of the oven and sprinkle with some freshly grated Parmesan cheese.